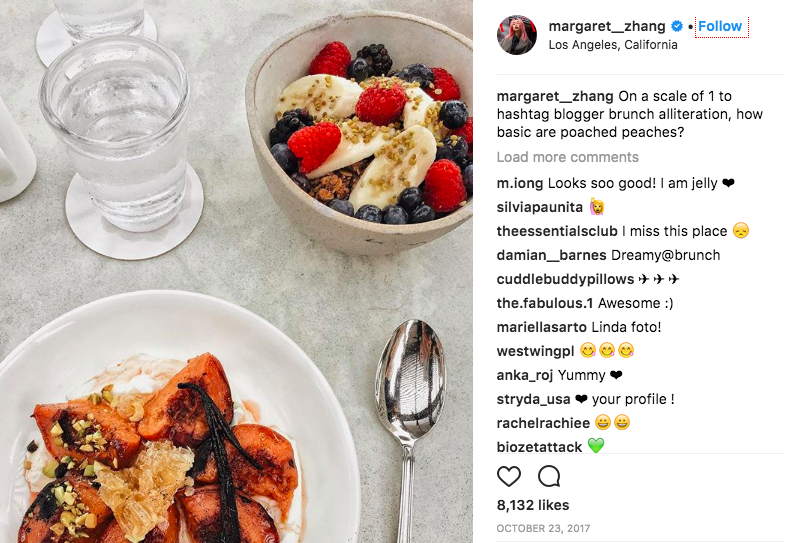 To engage customers on Instagram you have to know how to take Instagram photos that amaze — plain and simple. Visually-stunning accounts earn followers. For those selling products, know that 93% of people consider an image one of the most important factors in a purchase decision. People want to be inspired. They want to feel something. They want to love your profile. But depending on your industry, figuring out how to take Instagram photos that accomplish this may not be so easy. Taking great beauty shots isn’t as simple as professionals make it seem. Shooting consistent meaningful images for a personal brand takes dedication. If you’re in a B2B industry, you may be completely at a loss. No matter what your industry or skill level you can learn to take Instagram-worthy photos like a pro. We’ll help you showcase any industry and reach any target customer through visuals. Let’s explore various professional secrets, techniques and tools that expert Instagrammers use to create amazing photography. Once you complete this article, this daunting step will seem much easier. You’ll have a good idea of the visual impact you’re going for. You’ll know your subject matter, colors and how you’ll organize images on your page. 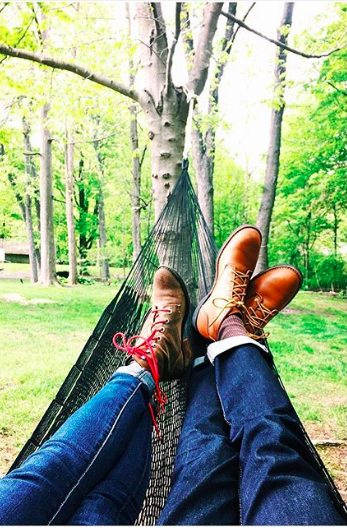 You’ll understand how to take Instagram photos that align with your goals and style. You can start building an effective Instagram strategy. Before you begin snapping and creating Instagram stories for business, contemplate your goals. How will your photography help you achieve them? What brand message will the visuals convey? Return to this plan as you begin building your photo collection. This will become the standard by which you measure every image you choose. We like when people like our photos. It feels good. And it seems like you are accomplishing something. But in the scope of things, a “like” on any social media platform means very little. Yes, it can have a positive impact if the post goes viral. But otherwise, most people don’t care how many likes something has. YouTube, Quora, and Reddit are the most common exceptions. Upvotes (likes) increase visibility significantly. Do you want people not to “like” your posts? Of course, you want people to “like”. But on Instagram you could end up chasing after random whims, trying to replicate the content that got so many likes only to fall flat. Instead, when you think about how to take Instagram photos, note which photos are getting comments. Make note of what you’re posting when you’re follower count is going up. Use this data to direct your efforts. Focus on consistent, goal-driven quality. That’s how to take Instagram photos that matter to your customers. We spend most of our days in poorly lit offices and homes. Our eyes are used to it. Sunny days are somewhat painful without sunglasses. But cameras, even the most modern ones, really love natural light. They don’t like to be pointed right at the sun. And there is such a thing as too bright. But natural light makes a huge difference. Colors are more vibrant. Borders appear more defined. It’s easier to read text. Plan to take photos in the early morning or just before dusk. Or prepare for your photo shoot on days when the sky is filled with white fluffy cumulus clouds blocking some direct sun. These are when outdoor lighting is at its most agreeable. Here, the photographer captured the natural lighting as a storm rolls in. If you’re new to photography, then cropping may be your best friend. It allows you to improve the visual composition. Place the focus more effectively where you want it. Zoom out a bit. Capture more. Then determine where to best draw the eye through cropping. They call it a snapshot for a reason. Without the expense of the film or bulbs people had to worry about just 20 years ago, we’re free to snap away. But in doing so, we often miss that perfect shot that’s right before our eyes. Instead, take a moment to ponder the shot. Consider the background, angle and composition. Is the shot cluttered? Could you move something out? Should you add more balance or sharper subject-matter focus? When you use your eyes first, you find the best angle and timing for the perfect shot. We say things like “she’s got an eye for photography” for a reason. It starts by using your eyes and brain to consider the shot. The camera is only a tool we use to capture what the eyes see so that we can share it with others. Touch up tools can add a more professional look to photos. You can use filters to create a more consistent look. 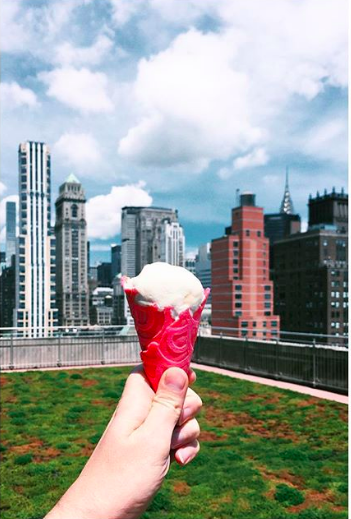 Editing can be how to take Instagram photos to the next level. But be careful not to overdo it. Not only is the time waste a huge strain on your marketing budget. Most editing makes very little difference to your followers. In fact, over-edited pictures can have the opposite effect of seeming fake, inauthentic and focused on the wrong things. That’s not what customers want to see on Instagram. Focus on taking better pictures from the start and identify some filters you can quickly apply to make images appear more consistent. If you find yourself trying to photoshop the blemishes on your employee’s faces, stop it. If you’re scrubbing stray hairs out of existence, you’re really going too far. The grid feature is available on many smartphones and digital cameras. It allows you to see the composition of your shot before you take the picture. If centering is important, do it easily with a grid. Or strategically place something, or multiple items, off-center. It’s not possible to make the real world conform to a grid perfectly. But it does help you see the hidden symmetry that’s already there. The background is rarely the focus on a picture. But sometimes the background becomes a logical extension of the item you are photographing. Use an intricate or colorful background to make something that is more plain pop. If the subject matter is colorful or busy then a less intricate background allows the item being photographed to speak for itself. Think about which best represents your brand and use the background to enhance that message. This is how to grow your business with Instagram. In this image, we can’t miss all of the buildings in the background. We see the Empire State Building sticking out there on the right. But it’s very obvious that the ice cream cone is where we should focus our attention. Even if you have multiple items in a picture, 1 item should stand out, immediately drawing your eye to it. It may be because it’s larger. It may be colorful. It may be a dramatic movement captured in a still. An image without a single focus point seems cluttered. The eyes and brain are forced to work to make sense of the image like this one from someone who apparently loves their makeup. 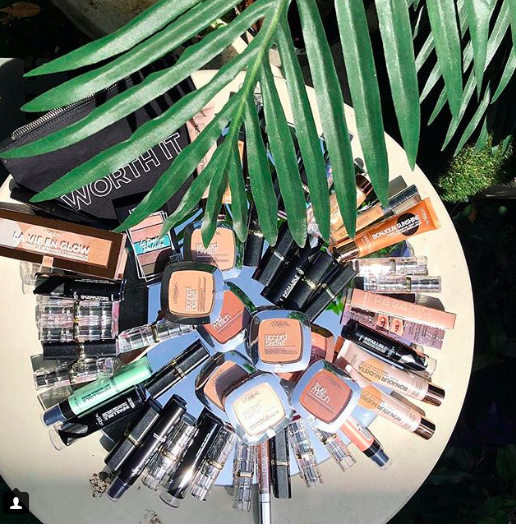 They’ve tried to create some order by having the products radiate outward. But the image for the most part just seems like someone emptied their makeup bag out on a counter. The leaf provides you with some balance to an otherwise chaotic shot. And the message “worth it” hiding behind the leaves adds a more obscured focal-point. But it takes a little time to decipher the image. Our brains are wired to react negatively to perceived clutter. Some people’s brains are more sensitive than others, causing repulsion. When there’s too much going on in a photo, people feel stressed. Their brain starts trying to sort out the unimportant to determine what’s important. Its attention is divided among many focal points. Want to know how to take Instagram photos that people love? Share images the brain can very quickly decipher and instantly feel something about. 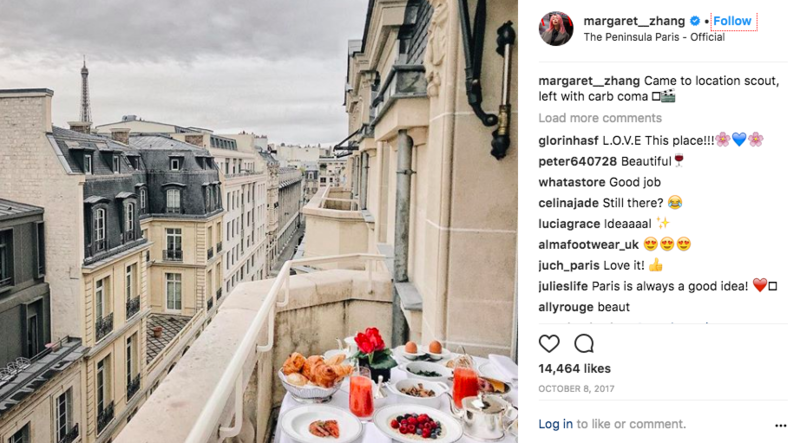 Professional photographers have a secret when it comes to how to take Instagram photos that make people stop and comment. They are always looking for that moment. They have their camera’s ready. You may not be lugging a heavy camera over your shoulder. But you likely have your smartphone with you 24/7. And sometimes you just know when those magical moments will happen. It may be the way a shadow falls across your office building. It could be a dandelion puff slowly falling in front your work vehicles. It could be a coffee ring left by the computer after a long night working hard for your clients. Show people in various activities that exemplify your dedication to customers. Or, with permission, show customers or clients delight in your products. Be on the lookout for these magical moments that you can tie to your brand. An organic farm Green Door Gourmet caught this image during their annual community strawberry harvest. If the colors in your image look bleached out with too much light, there’s not much you can do you make that photo Instagram-worthy. If the image has a lot of noise (graininess), you can’t get rid of it. That’s why professional photographers often under-expose their photos. They can then lighten it in editing to perfectly capture the moment. It doesn’t work the other way. Darkening images that are too light just look fuzzy. This works great when you’re visually documenting an outdoor event. You can’t wait for a cloud to move overhead to limit the sunniness. You have to work with what you have. Most good smartphone cameras and digital cameras have the features you need. They reduce the exposure to limit the light that comes into the camera. If you’re ready to find out how to take Instagram photos to the next level, learn about your camera’s exposure modes. These 3 work together to create different exposures. Similar to mixing paints, you can increase or decrease each of these to obtain a desired exposure level. Many combinations can achieve the same exposures. Let’s look at how each of these impact the finished product. Shutter speed reduces or increases blur, depending on your desired effect. Why would you want more blur, you might ask? Consider photographing a waterfall. You typically want to photograph the waterfall as a whole (the water moving down) rather than photographing a single moment in time. You’d use a slower shutter speed to capture a second more of time. This makes the water appear smooth. But if you’re trying to catch an action shot on a field, you want a precise moment frozen in time down to the millisecond. That requires a fast shutter speed. More advanced cameras have higher ISO speeds for less grainy images. Adjust it to get a clearer shot of your subject matter. It makes an image seem deeper or more shallow. If you’re photographing hills or buildings in the distance, you need a narrow aperture. This reduces the width from which the camera receives light so that the camera can “see” further more clearly. A wide aperture makes more sense for closeups. The foreground becomes very crisp, allowing the background to fade into the distance. 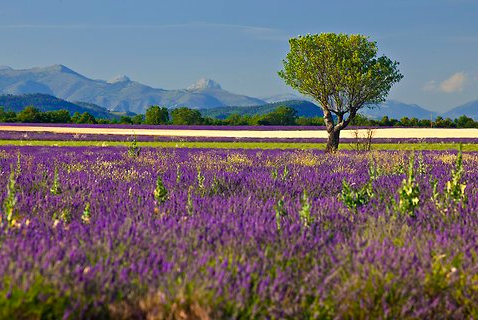 By adjusting your aperture you show the viewer where they should focus, close or into the distance. The typical camera will have settings similar to these. Keep in mind what each of the above terms means to choose the best setting the type of photo you plan to take. View your manual to note any setting differences and the symbols that represent these settings on your camera. Auto — Your camera chooses the configuration of these 3 settings. This will show you how to take Instagram photos that are decent. But it may not be the ideal setting for tougher shots like action and distance shots. Program — Camera automatically sets your shutter speed and aperture. You adjust the ISO speed manually to get the best shot. Aperture Priority — You set your own ISO and aperture. The camera chooses the best corresponding shutter speed. Shutter Priority — You set the shutter speed and ISO. The camera chooses the aperture. Manual — You control all 3. Only recommended for professional photographers. Admit it. Right now you’re an amateur Instagram photographer trying to take things to the next level. One day you could be an expert. But for now, consider which 1 of the 3 exposure elements is most important for the type of shot. Let your camera handle the rest. This is how to take Instagram photos that delight. Find ways to add action to the image. You’ll need a fast shutter speed for this one to avoid a blurry trail of color. You can do this on most smartphones. 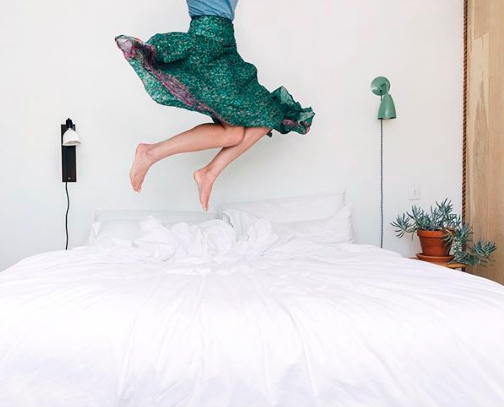 If you sell bedding or dresses, you could just take a boring picture of either. Or you can add interest by making the photo active. Let your creativity run wild as long as your images align with the overall feel and branding message of your page. You may also have a burst mode. That’s how they take those intricate photos of powder or paint hitting something. Or capture the fine details in smoke. A professional photographer may use HDR Mode (High Dynamic Range) on their camera with ease. But it’s really hard to perfect. And you could miss out on an otherwise amazing shot trying to figure it out. Sometimes learning how to take Instagram photos includes knowing your limits. This mode takes the photo at many exposures at once. It then puts it all together for a more detailed shot. Don’t totally give up on DMR if you want to pursue it. Practice this one in your downtime before trying to apply it to your photo library. A strong contrast can occur in many ways. It might be a bright color across a plain background or vice versa. It can be defining shapes or lines. It may be an image of something that seems to be where it doesn’t belong. 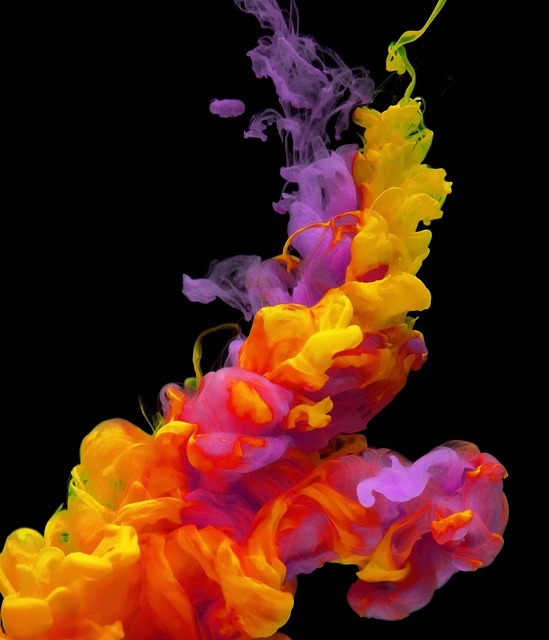 This image has several contrasting elements that ad great visual appeal. First, you may notice the bone white stone contrasted against the gray and blue sky. Second, the building has sharp angles that contrast against the puffy clouds, however menacing they might be. Finally, the center tower has a small red roof that stands out against the otherwise muted colors in the photo. Do you have a product or subject matter that’s not particularly interesting? In fact, it’s just plain boring! It can still be a hit on Instagram. Figure out how to take Instagram photos of it from a different angle or in a different setting. The angle from which you take a picture can completely change how people feel about the subject matter. And yet so often everyday photographers just stand back about 6 feet to take the photo. How you capture the image is as important as the subject matter itself. Find out which angles flatter your subject matter. Try taking photos from a ladder. Get down under the object. Take pictures from the floor up. The rule of thirds creates more thought-provoking shots. Instead of making the subject matter of your photo the center of the photo, position the camera so that it is in the left, right, top or bottom 3rd of the frame. Rather than centering an edge of a table, horizon, corner or other dividing line, re-frame the shot so that this dividing element in at a third of the image. The New York Times presented a great example from photographer Bryan Peterson. Note how the tree is in the right 3rd of the photo — not the center. The sky is a 3rd of the photo rather than having the horizon falling in the middle of the shot. The taller peaks of the mountains also take up about 1/3 of the photo. 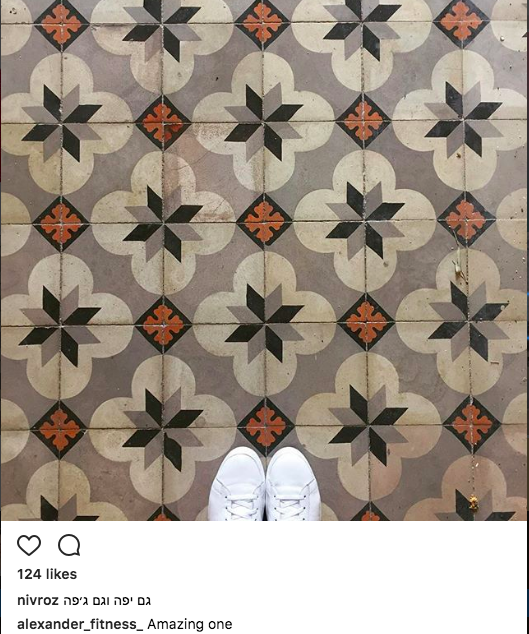 Some of the best Instagram photographers respect white space — or space of a similar neutral color. White space gives your subject matter some breathing room. It allows the focus to stand alone in the image. You don’t have to make every photo a close up of someone or something. Allow the focal point to overcome all of that seemingly useless space to send a message of confidence. 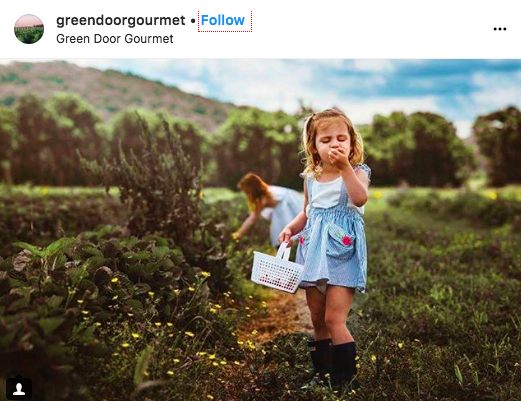 This goes back keeping the image’s focus simple and bold so you can drive more traffic to your website through Instagram. Is that your office building or a model of your office building? Is that outdoor play gym on your website tiny or huge? Photos by themselves don’t show how big or small something is. But placing a commonly sized something in the picture gives an immediate reference point for size. This does so much more than simply giving the dimensions can. It tells people at a glance how big something is. Consider which one makes the most sense for your brand. In eComm, it helps avoid those frustrating “it looked bigger in the picture” one-star reviews. You know the ones. Don’t be afraid to stay out with your camera after the sun goes down. A good modern camera can take pictures after dark. And it will amplify things you can’t see with the human eye. 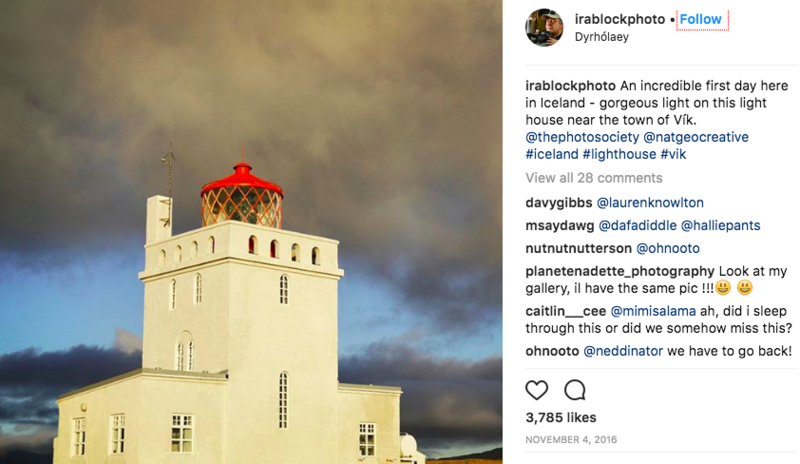 Find ways to incorporate nighttime photography into your Instagram brand. This is how to take Instagram photos that people consider one of a kind. Along with night photography, try taking pictures underwater. This isn’t something that people see on every business Instagram account. Water-proof camera cases are affordable. They allow you to capture angles few people ever see. It’s uncomfortable to open your eyes underwater. If your brand can be associated with water in any way, a water-proof camera case is a great investment. 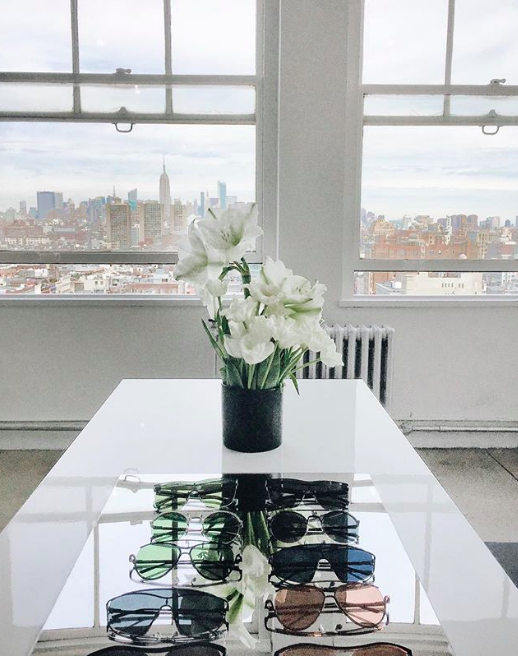 This is how to take Instagram photos that speak volumes about your brand. You’ll go to any lengths to delight your customers. Whether you’re a small business or a personal brand, you want to create a visual experience that helps drive traffic to your Instagram. It should engage that traffic. It should help you meet your goals. 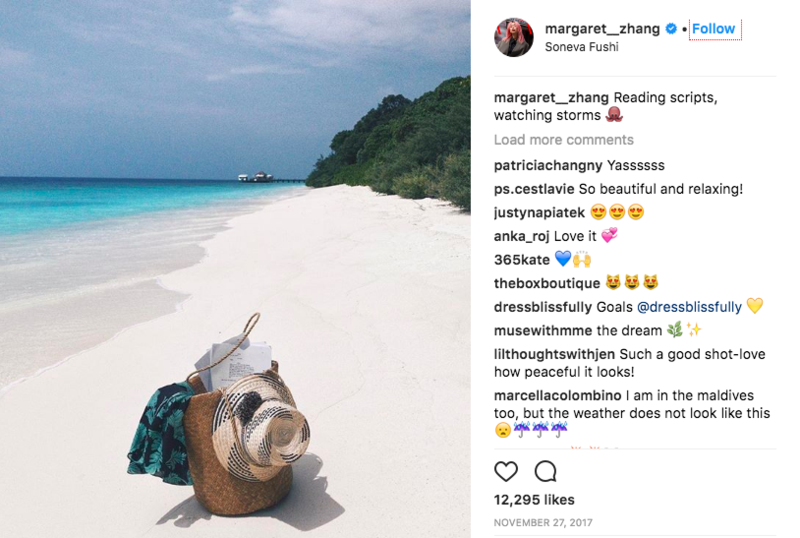 These methods will help you create the visuals people are looking for on Instagram. Learn more about how we can help you grow your brand through Instagram. Contact us today.